New Orient Hotel Danang brings a romantic space to your dream wedding. With 450 sqm, Camelia Wedding Ballroom is available for up to 450 persons. 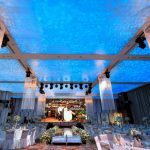 The ballroom is decorated elegantly featuring LED lighting technology on the ceiling, morden sound system, quality banqueting facilities and wi-fi. Our dedicated team of experienced catering professionals will assist you towards making your wedding dreams come true.